Wednesday Wrap: AKG headphones, Arcam MusicBOOST S, Amazon Prime Music and more | What Hi-Fi? From the news that AKG has a new range of affordable headphones, to Sony announcing an HDR update for its VPL-VW320ES projector and Amazon Prime Music now streaming on Sonos, it's What Hi-Fi? 's Wednesday Wrap. 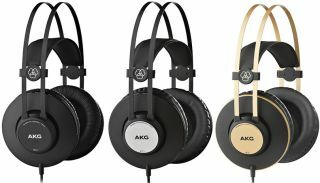 AKG has three new pairs of headphones out, each costing comfortably less than £100. The K52, K72 and K92 (above, left to right) are all closed-back designs and are available for £35, £47 and £59 respectively. All three are fitted with 40mm drivers - the differences between them lie in the frequency response. The K52s are 18Hz to 20kHz, the K72s 16Hz to 20kHz, and the K92s 16Hz to 22kHz. AKG has used an exposed headband design for the new range, which, it says, allows the 'phones to remain comfortably light without compromising on driver size. The headband is also said to be self-adjusting to help create a more secure fit to block out external noise. Arcam has announced an ‘S’ upgrade of its MusicBOOST DAC for the iPhone 6 and 6S. The original MusicBOOST fits the iPhone 6 but struggles to fit the 6S properly because of the new phone’s extra millimetres. The new version has been adjusted to fit both models perfectly. The MusicBOOST S is available now for £120 and promises to upgrade the audio output quality from your iPhone, as well as doubling up as an external battery pack. Sony has announced a firmware update for the VPL-VW320ES home cinema projector that will allow it to support High Dynamic Range (HDR). The update will bring the number of Sony 4K HDR home cinema projectors to three, with the 320ES sitting alongside the VPL-VW5000ES and VPL520ES. Sony has said the update will bring improved contrast, greater colour depth and brighter highlights when used with HDR content, whether it be from Ultra HD Blu-ray or a streaming service such as Netflix or Amazon. Creative has launched the Aurvana ANC headphones with noise cancellation. They sport a lightweight design and memory foam ear pads for a comfortable fit - ideal, says Creative, for long listening sessions on commutes or on aeroplanes. A durable braided cable with in-line microphone and control buttons is supplied. Microphones built into the ear cups monitor external sound levels and the headphones then cancel out any noises entering the ear cups. Music is delivered through 40mm neodymium drivers. The Aurvana ANCs are available now £100. Sonos has announced that Amazon Prime Music subscribers can now stream music though its multi-room speakers. The music-streaming service has been available as a Beta in the US since October 2015, but today Sonos has confirmed that everyone can now stream the entire Amazon catalogue. Prime Music comes as part of Amazon’s £79/year Prime package, which includes unlimited next-day delivery and Prime Instant Video. Swiss manufacturer Feniks Audio has produced what it claims to be the “world’s best computer speaker system” - Essence. The 2.0 speaker system uses Feniks’ custom-desiged 4.5in coaxial drivers and an integrated 24-bit/96kHz DAC, designed for the Essence by Gordon Rankin. Inputs include USB, digital toslink and analogue RCA and there’s an “audiophile-quality” headphone amplifier output. Everything is housed within an aluminium cabinet which, along with the majority of the internal components, is designed and manufactured in Switzerland. The Essence speaker system is currently seeking funding on Kickstarter where it’s looking for 80,000 Swiss Francs - around £55,000. You can pre-order a system from 1199 CHF (£844) with worldwide shipping included. UrtheCast is giving away 4K Ultra HD footage taken from its satellites in space. Attendees of the 2016 National Association of Broadcasters (NAB) in Las Vegas will be able to fill out a survey to gain access to the content, but you can also complete the survey by following this link. The footage can be used for broadcasts, documentaries, feature films and any other use you can think of.